The selection of music also illustrates what happens to music the artifact: it ends up somewhere, far from the time and place of its creation, far from its original context of meaning and popularity, far from all the invisible social and cultural codes and discourses and heavy promotion that made it work so well as a sonic glue that brought people together and feel so special back in the day–whether we’re talking about Sade’s “Smooth Operator”, EW&Fire’s “Shining Star”, or Michael Jackson’s “Billy Jean.” And even as the musical artifact languishes on drugstore racks, the sounds of these artists are kept alive on oldies radio or on Walmart commercials. When we hear the music we feel stuff in different degrees and ways depending on our age and stage. The music cues times past and sometimes even vague memories. 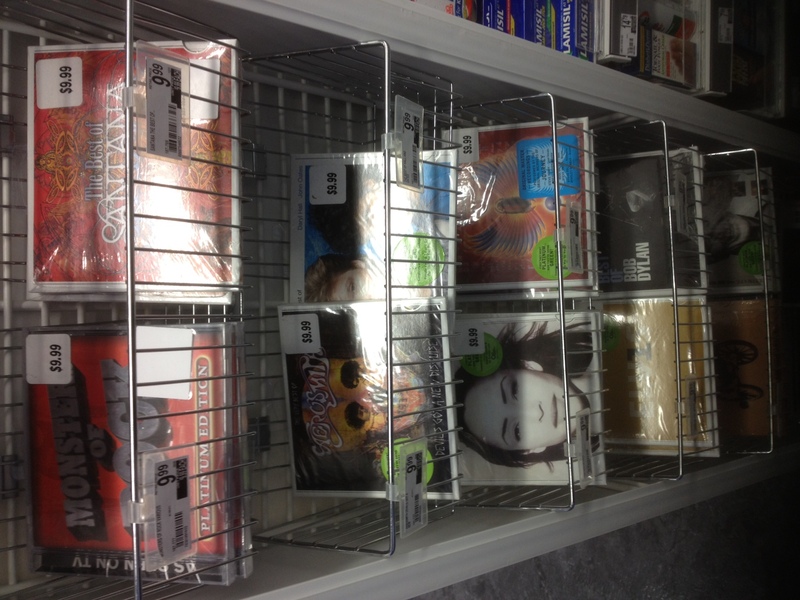 The rack of CDs also reminds me of the workings of the popular music industry itself. We didn’t begin to see its tissue and sinew revealed until peer-to-peer digital downloading became a big deal in the late 1990s. This free sharing of music led to a widespread realization that the music industry had been manufacturing all this material stuff–78s, LPs, cassettes, CDs–but now MP3s and the Internet had crashed the money-making party by doing away with music’s former material containers. That’s what makes the rack of CDs so pitiful: it reminds us that we don’t really need music on a piece of plastic anymore, only hard drives to store our collections. Or wait, not even that: there’s cloud computing now. Maybe in this way music is at last returning to the ether where it belongs. Anyways, music was always promiscuous–it always wanted to be free. At the MB-5 conference, other speakers predicted that in the future we would pay for our music as a monthly fee–like a utility bill. Fast forward to 2012: surprisingly, despite the popularity of the Apple iTunes store and the I-can-own-any-one-song-for-99 cents business model, the music-as-utility future is already here in the form of services like Spotify. For ten dollars a month you have millions of pieces of music to listen to whenever and wherever you wish. Sounds pretty good to me (if only I could listen to millions of pieces of music per month). So, where are we today? One wonderful thing about music free of its material containers is that it moves about so easily. And despite all the naysaying about the reduced sonic quality of MP3s, it turns out that most of us don’t really mind. It turns out that our interest in music these days is not all about sound resolution or fetishizing the musical object. It’s about being able to choose freely and juxtapose and listen to all eras and styles at once. If most of us are confined to the locales of where we live, then at least we can be cosmopolitan in our musical lives, finding alternate ways of experiencing the world through sounds from elsewhere available in an instant. Any young person who has grown up knowing only a Internet-connected world pretty much lives their music listening life according to this logic. Case in point: when I taught music to 9th graders I was always amazed at the wild variety of music on their digital devices–composers and bands from all eras and styles and cultures crammed up against one another in one glorious Musical Present. Like YouTube. And it didn’t matter where the music came from or how it was once packaged or marketed to a listening demographic. Maybe it was heard on a commercial (AC-DC on a Walmart ad perhaps?) or sampled on someone else’s song or discovered via YouTube surfing. The only thing that matters today, it seems, is whether or not the sounds speak to you in some way. But back to that rack of CDs. Not only has the music industry long bottled music as 78s, LPs, cassettes and CDs that we must get our hands on and own. It has also long used bands to brand and bottle musical style for us to align our tastes and identities with. But if information, as Barlow says, truly wants to be free, then perhaps so does musical style and our tastes and ways of self-identifying with musical style. Instead of buying this musical product rather than that one, we have the option of learning to identify with all music. I realize that this is a naively idealistic and relativistic critical stance. But it’s also what reveals the choice between Michael Jackson, Elvis, or AC-DC and the other “classic” artists available for sale in the drugstore as so dismal. To be a truly free listener is to be reminded of how much music is out there that we haven’t yet met and said hello to.